January can be such a gloomy month. Christmas is over, the weather is colder and the nights are longer. So we thought this was the perfect time to reminisce about one of the favourite weddings of 2014. What we loved most about this wedding, other than the fact that Leila and Johnnie were such a charming couple, is the fact that the two days were truly unique and personal to them. Personal touches are so important in making your wedding fun, different and special – and this wedding certainly had that and much, much more. 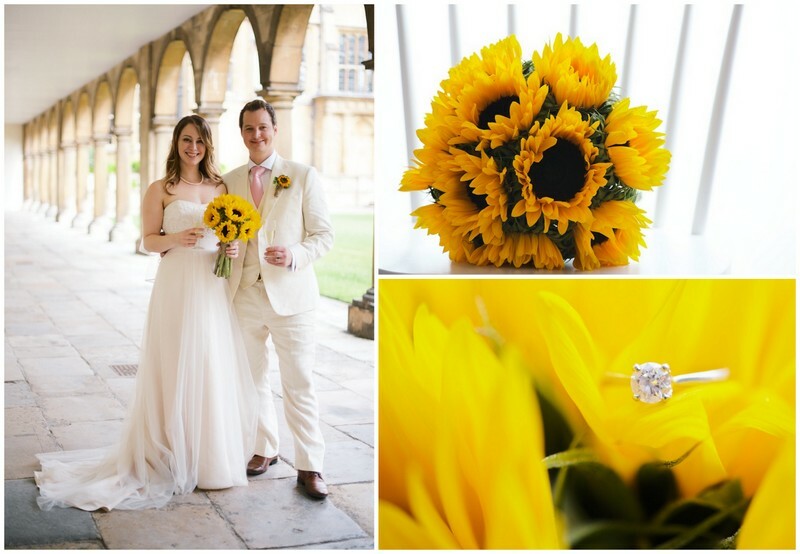 Our lovely clients, Leila and Johnnie, had a romantic, fun and very sunny wedding in Cambridge in June 2014. The wedding festivities actually took place over two days and involved six different venues. Johnnie and Leila had always planned to do things a bit differently and were determined not to have a “cookie cutter” wedding. Early on in their plans they knew they wanted to hire a wedding planner and we were so thrilled to get the call from them. We assisted them to find their perfect venues, book all their wedding suppliers and manage the two wedding days. 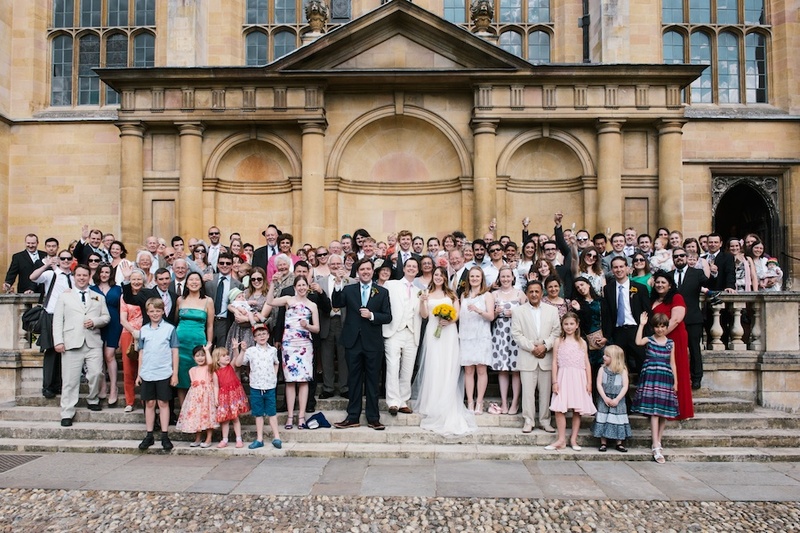 Their legal marriage ceremony took place on the Friday, at the Cambridge Registry Office, but not before a small group of 20 close friends and family joined them for an intimate meditation ceremony at the Hotel du Vin in Cambridge. Dinner that night was at The Back Street Bistro. 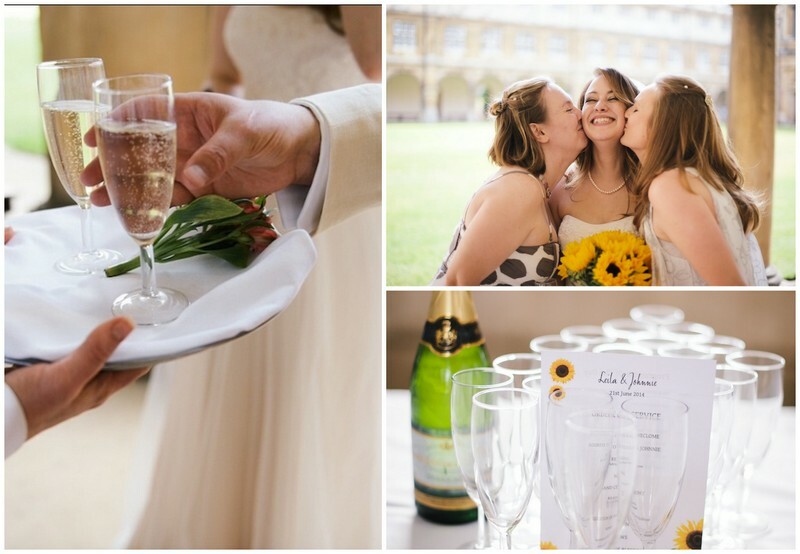 The second day of their wedding involved four lovely venues in the historic City of Cambridge. It all started at the Cambridge Union Society. The lovely Rebecca Waldron of White Rose Ceremonies presided over a bespoke and very personal Humanist blessing. During the blessing, Leila and Johnnie exchanged their own handwritten vows and guests got involved with a sing-a-long to “Can’t Take My Eyes Off You” by Andy Williams. Leila looked beautiful in her gorgeous dress which she got at David’s Bridal at Westfields in Stratford. 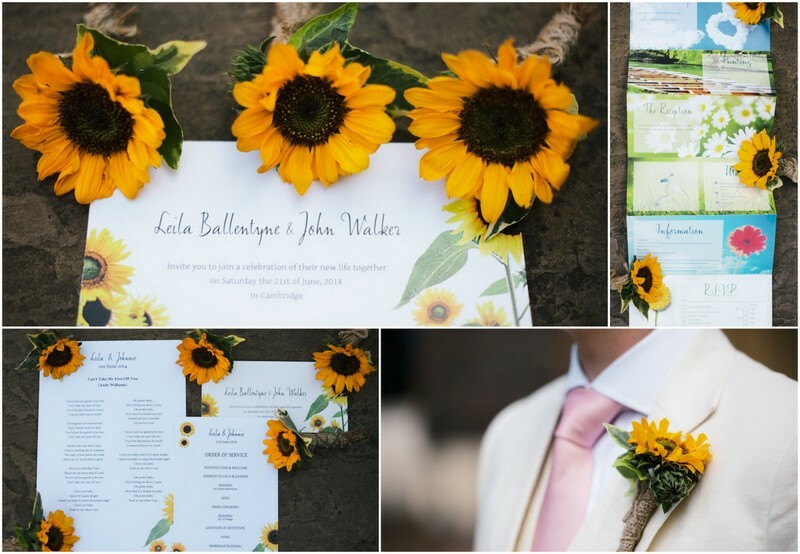 The Bridal Bouquet, consisted of sunflowers, which were an ongoing theme for the day, having been featured on their Wedding Invitations, Order of Service, Naked Wedding Cake and Table Centrepieces. Leila and her bridal party had their hair done at Hairy Canary in Cambridge. 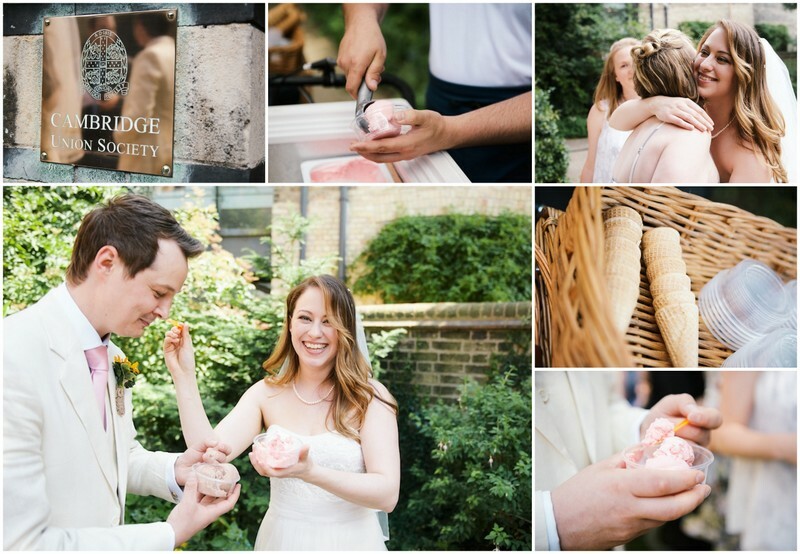 After the blessing, guests joined Leila and Johnnie for ice cream and drinks in the sunny courtyard of the Cambridge Union Society. It was then time for stage two of their special day. 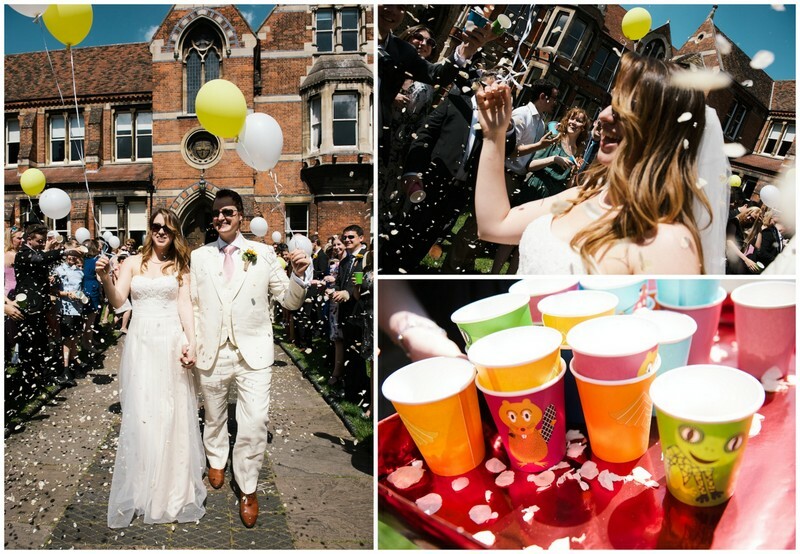 Guests were handed white and yellow balloons before being lead through the streets of Cambridge by the Bride and Groom down to the River Cam for a private punting tour by Cambridge Chauffeur Punts. 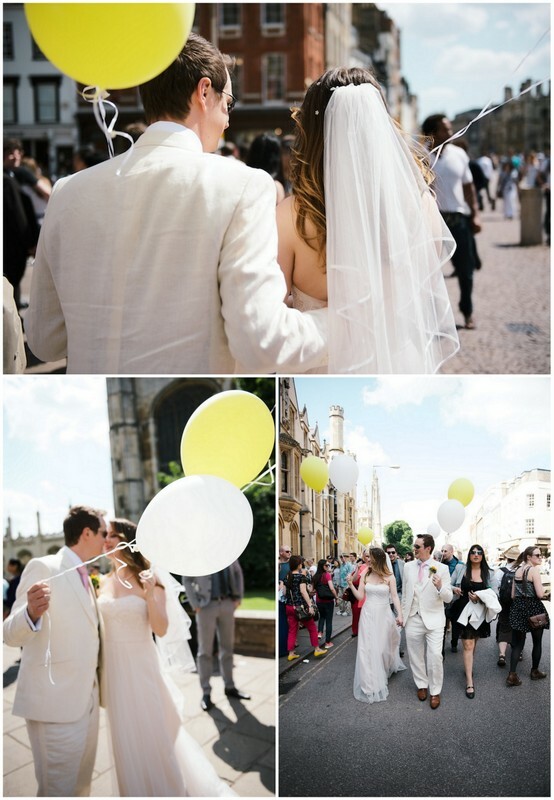 Their journey would take them on to the Reception venue, Trinity College, Cambridge. 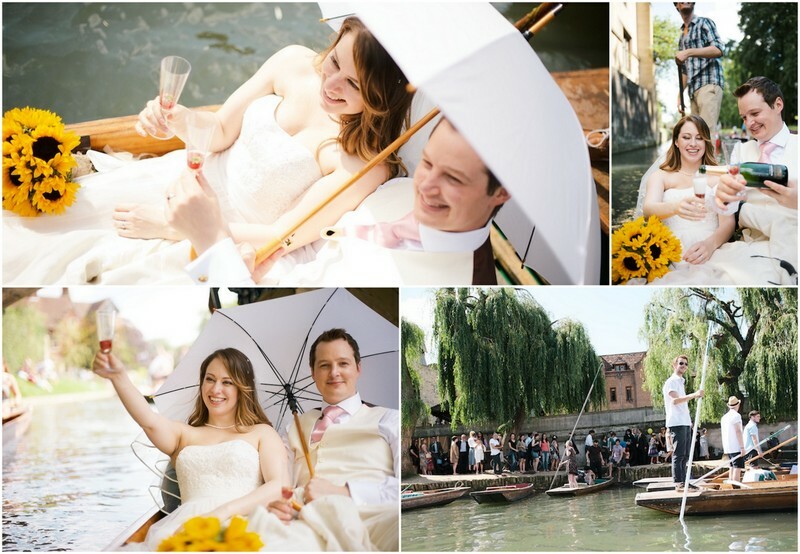 The sun shone whilst 120 wedding guests enjoyed fresh strawberries and champagne whilst sitting back and relaxing on a traditional chauffeured punt up the river Cam. The British weather really could not have been better. Leila and Johnnie had their own punt, as they should, and were able to enjoy some time together before rejoining the rest of their guests. 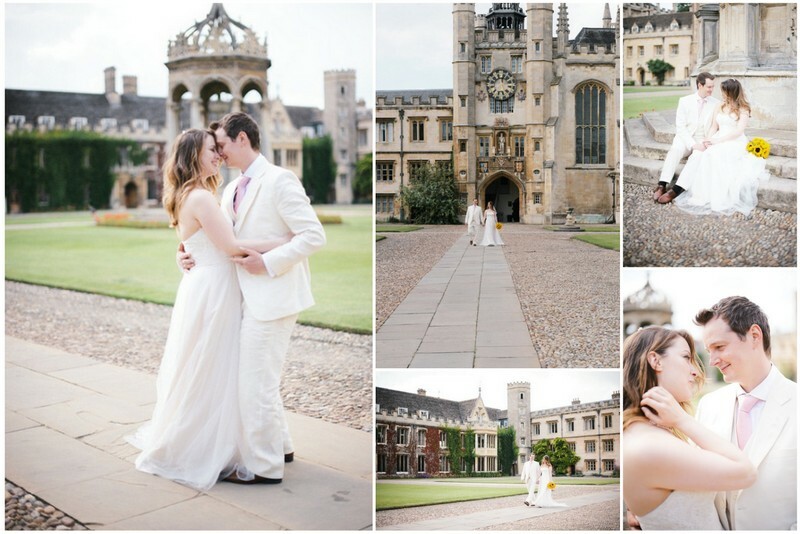 Johnnie studied at Trinity College, and as a past student, they were able to have their wedding reception here. When they were searching for their perfect wedding venue location, they looked at many beautiful and traditional venues. But the moment they walked into the grounds of Trinity and saw magnificent Hall, they knew that no where else would do. They fell in love with it immediately. As guests were assisted off their punts they were welcomed by the staff at Trinity and escorted to the Cloisters for a drinks reception, with delicious canapés and yes, more champagne! 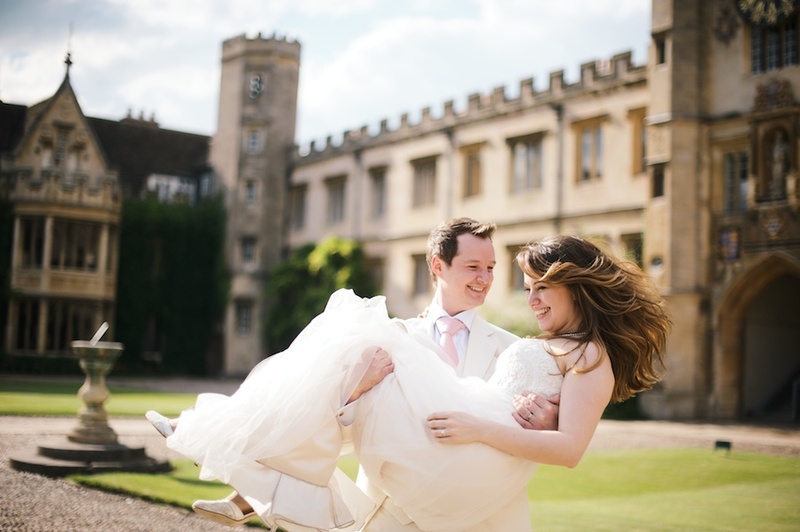 There are so many beautiful backdrops and settings at Trinity College, that our photographer, Kate Nielen, was spoilt for choice. The official photographs of this lovely couple, their family and guests, took place by the lush lawns, which are sacred at Trinity. Kate had special permission to walk on the grass – a very rare privilege. Guests were asked to remain on the paths. 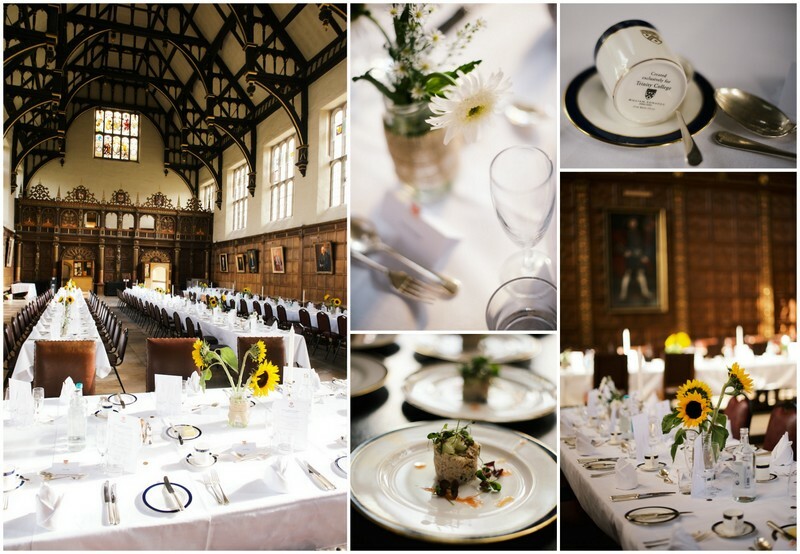 The sumptuous wedding breakfast was served in Hall at Trinity and dinner was prepared by their amazing in-house chefs. The flowers for the banqueting tables were provided by Donna at Country Garden Florists consisting of sunflowers, gerberas and mini daisies. Each arrangement was designed by Leila and put together by the Stylish Events team on the day. Following dinner, guests were asked to follow Leila and Johnnie to the final wedding venue of the day. The atmosphere was to change once again, this time to an amazing evening party. So, balloons once again in hand, guests walked to The Hidden Rooms, where a VIP area had been roped off for them. 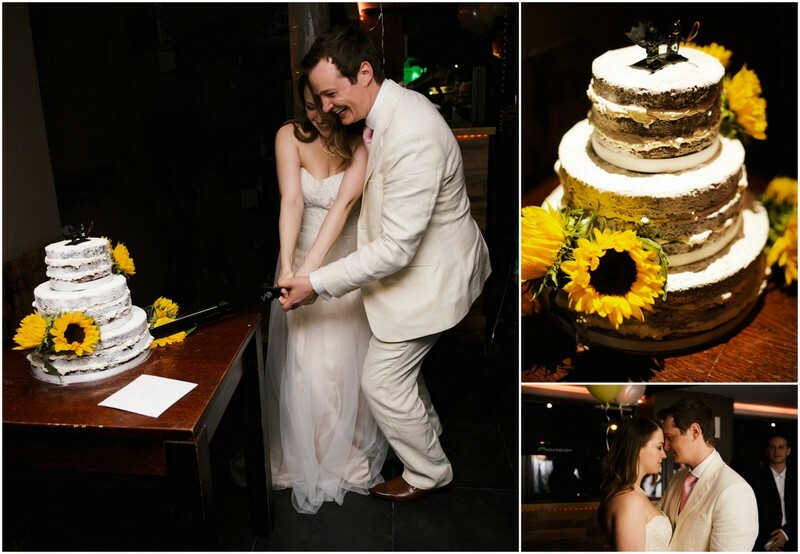 Leila and Johnnie’s “naked” wedding cake, complete with sunflowers and Batman and Catwoman caricatures, was cut with real swords, which were a gift to Leila. Everyone then danced the night away until the wee small hours. “We wanted to say one more huge thanks to you all. The two days were perfect in every way. Everything lived up to and exceeded our expectations, and we both know it wouldn’t have come close without all the hard work you did.